Navy and Marine Corps are Applicable. 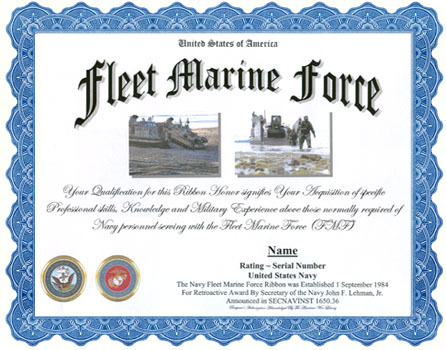 An unaltered photocopy of your DD-214, WD AGO, NAVPERS, NG or other military issued document clearly displaying your award of the Fleet Marine Force. The Navy Fleet Marine Force Ribbon was established on September 1, 1984, by Secretary of the Navy John F. Lehman, Jr. and was announced in SECNAVINST 1650.36 of September 1, 1984. 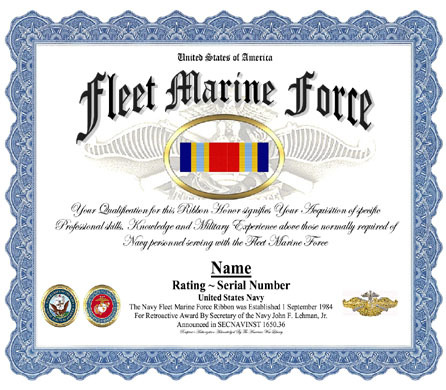 The Navy Fleet Marine Force Ribbon has been in effect since August 31, 1983. Active duty Navy officers must serve a minimum of 12 months with the Fleet Marine Force and Navy Reserve Officers must serve a minimum of 24 months in a Naval Reserve Fleet Marine Force unit with satisfactory drill attendance. The usual requirements for this ribbon may be waived by the awarding authority in cases where Navy personnel demonstrate exceptional skill, knowledge and leadership while providing support to the Marine Corps in a combat environment (while receiving hazardous duty pay). 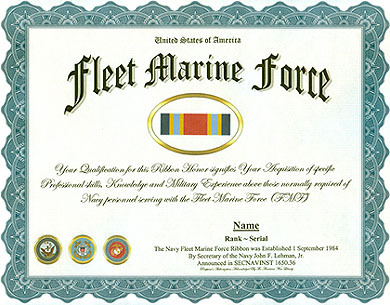 The Navy Fleet Marine Force Ribbon is worn after the Selected Marine Force Ribbon and before the Navy Expeditionary Medal. No devices have been authorized for this ribbon. (a) Be assigned to a FMF unit. Only those personnel assigned to Type II and Type IV sea duty are eligible. (c) Satisfactorily pass the USMC Physical Fitness Test (PFT). All applicants, regardless of age, must complete this requirement. Those individuals over 45 years of age, if found physically qualified by a medical officer, shall take the Marine Corps PFT under the age category 39-45. (d) Be recommended for the award by the Marine Corps Battalion/Squadron Commanding Officer. 1. Serve a minimum of 12 months with a Fleet Marine Force (FMF) unit. 2. Graduate from Field Medical Service School (FMSS) or Chaplain and RP Expeditionary Skills Training (CREST) course and obtain the appropriate Navy Enlisted Classification (NEC) (HM 8404/DT 8707/RP 2401). Navy personnel assigned to a FMF unit who have no Navy Enlisted Classification Code (NEC) producing pipeline school, (i.e., YN, PN, DK, etc.....) are also eligible. 3. Have no single performance trait mark below 3.0, and no promotion recommendation lower than promotable for the last two periodic evaluations. 1. Serve a minimum of 24 months in a Naval Reserve FMF unit with satisfactory drill attendance. 2. Obtain the appropriate NEC (HM 8404/DT 8707/RP 2401) for their billet. 3. Complete a 2-week Active Duty Training period in support of a Marine Corps field training exercise. 4. Have no single performance trait mark below 3.0, and no promotion recommendation lower than promotable for the last two periodic evaluations. 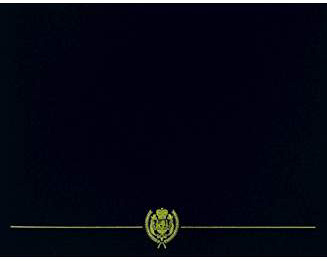 (c) Navy Active Duty Officers must serve a minimum 12 months duty with the FMF. (d) Navy Reserve Officers must serve a minimum of 24 months in a Naval Reserve FMF unit with satisfactory drill attendance. The above requirements may be waived by the awarding authority in cases where Navy personnel demonstrate exceptional skill, knowledge, and leadership while providing support to the Marine Corps in a combat environment with concurrence of CMC/CNO. Only Marine Corps battalion/squadron commanding officers may award the Navy Fleet Marine Force Ribbon. There are no subsequent awards and no citation or certificate will be issued. Commanding officers shall make appropriate service record entries for enlisted personnel, and issue letters of eligibility for officer personnel. Award of the ribbon shall be noted in the member's next evaluation or report of fitness. Advancement Credit. The award of this ribbon shall entitle enlisted personnel to be designated FMF and have two points applied on the E4 through E6 advancement exams.